And we’re back from a great lunch for the best session of the day, about Siri, Google Now and Google Glass with the great Ari Nahmani, Barry Schwartz, and myself. Actually as I write this we haven’t even gone to lunch yet. Since I’m on this panel I had to pre-blog it, but I think I can get this down. Ari’s going first and he’s full of great insights about Siri. I’ll link to his presentation later. [Update: Ari’s presentation on Siri]. My turn. I ask people if they remember when we used to think Google was a search engine. It’s not. It’s a massive intelligence with a search interface. Back in the day the search experience involved having an idea, typing it in, and getting back a list of web pages. Each of those stages is now optional. The process may not start with me having an idea. Google may have information that it wants to give me. If I am searching, I may be talking, or thumb typing on my phone. And the results may be a list of cards with information. Or the result may not be information at all, but Google performing an action. So let’s go through what this is, where it’s going, and what you can do better reach your customers. When I pick up my phone in the morning it gives me traffic and weather and scores from any games my favorite teams played last night. It shows me price for stocks I wish I owned, flight status, friends birthdays, news stories that I might be interested in, updates to sites that I’ve visited. Most of this it figures out implicitly. If you’re using Google’s services then it already knows what your searching. It knows what pages you spend time on. It knows where you live. It also lets you customize and tell it things explicitly. Suggested search isn’t just on Google Now. Curiyo for example, which I’m advising, has its own form of suggested search. It underlines interesting names and phrases and provides search results and information. Until around 2005 we accessed the internet almost exclusively through desktops and laptops. Now we’ve added smartphones and tablet and that’s just the start. Wearables and consumer electronics are becoming significant. Google just bought Nest for $3.2 billion. Nest makes smart electronics for your home. Smoke detectors and thermostats for example. Intel is launching a tiny biometric patch that I put on my skin and it records my vitals. Google is also working with car companies, so Android is going to be built right into your dashboard. At some point it’s obviously going to be giving you commercial recommendations like restaurants and entertainment. It can remind you of upcoming birthdays and anniversaries and Valentine’s Day and help you pick out gifts. But if Google has control of my home electronics and knows where everybody is, I’m looking forward to it telling me when somebody is in my living room and giving me choices of how to mess with them. Soon Barry’s Jew Glass is going to tell your Rabbi or your wife what you were looking at. If any of you are old enough to remember the 90s, companies spent a lot of time and money getting all the knowledge that was in paper documents into digital format that their computers could understand. That’s how you should think of your business relationships and processes today. It will help your marketing if you can get your business processes and relationships move to the cloud, or at least reflected in it. Simple example. I was at the dentist last week. She made my next appointment. On her computer of course, this isn’t the 80s. And then she handed me a printout of my next appointment. Everybody benefits if we put that process on the cloud. She can ask for email, I’d give it to her because it benefits me, and then in that email she could ask me to connect on social networks and review them. So Google will know that this dentist has one more person who hates them – well, maybe dentist is a bad example. It can automatically set up a confirmation RSVP the day before my appointment. 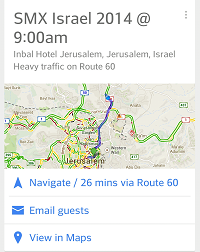 Google Now would remind me of my appointment, and Google will know that this dentist has a lot of real live customers when it’s ranking dentists in Jerusalem. You need to feed Google’s knowledge base. If you’re a local business it’s critical to get into Google Places for Business and competitive services like Yelp. Get reviews. Get on Google+ and other social networks. Thinks less about getting a million virtual followers and more about getting your online profile to reflect your offline reality. Use schema.org to mark up your pages. You can carefully add content to sites like FreeBase and Wikipedia and to smaller suggested search players like Curiyo. To summarize, back in the old days if you were trying use Google to connect your product with the customers who wanted it, you built a webpage, got it indexed and ranked, and waited for your customers to ask for it. But we should also tell Google directly about our products and services and try to get Google to tell our existing and future customers about it when it thinks it’s the right time. But remember that the fundamental things apply. How you do that changes, but never take your eye off those concepts. After a rousing applause Barry gave a great presentation about Google Glass. I’ll link to that here later. [Update: Barry’s presentation on Google Glass]. Update: Here’s my Google Now presentation, with audio. Then there was awesome Q&A, and I’ll update this post with the best from that. Question: So is this stuff all future, or are there things I can do now? Me: Get your business processes and relationships on the cloud. Get local listings and reviews where appropriate. Any information about your products and services that you want people to know, get it into Google’s knowledge base by using things like structured data or Feedbase, Wikipedia. You can already do these things now, some of these payoffs will come now, and you’ll be setting yourself up well for later. Check out the rest of our SMX Israel Live Blogging and our Best of SMX Israel post later today.